To the inexperienced stock trader trading stocks online is like trying to infuse the whole of Engineering mathematics into your head. However, the guy who has been in the business of trading stocks on the internet for a long time sees it as fun. With the technological advancement of being able to trade stocks on the internet, more traders have emerged in the stock market. Though, some of these stock trading software tools and online brokerage account may sometimes be complex and difficult to use if you are new. The first thing you should do before investing your money in stocks is to get an in-depth understanding of how the stock market works. This means you have to have an idea of what other traders think about the particular company in the stock market. If you are good in analysing the stock market, then you will be able to ascertain when stock prices will rise or fall. This means you would know when to buy and sell. Patterns that could be identified in your technical analysis include identifiable price boundaries in the market price stock. The high boundary, which the stock rarely surpasses, is known as the "resistance." The low boundary, which the stock rarely dips below, is called "support." As a trader when you effectively identify these levels, you will be able to ascertain when to buy and when to sell. The head and shoulder is a common terminology used to describe peak price and drop, followed by a taller peak then drop, and finally followed by a peak similar in height to the first. This pattern signals that an upwards price trend will end. There are also inverse head and shoulders patterns, which signify the end to a downward price trend. 4. WHO IS A TRADER AND WHO IS AN INVESTOR? You must be able to discern between and investor and a trader. 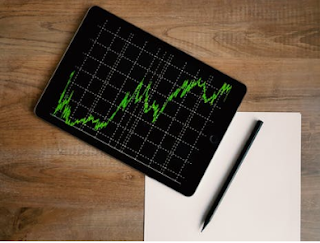 While an investor is looking for a competitive advantage in the stock market that will yield sales and earnings over time, the trader seeks companies in the stock market with recognizable price trend that can me exploited in a short period of time. As a trader, you make use of technical analysis, while as an investor you make use of fundamental analysis. To successfully trade stocks you have to learn what traders use to specify the trades they like their brokers to make for them. I.e traders can the market order which purchases or sells a set number of shares of a security at the prevailing market price. In contrast, a limit order buys or sells a security when its price reaches a certain point. Also, another example is placing a buy limit order on a security would instruct the broker to only purchase the security if the price fell to a certain level. This allows a trader to specify the maximum amount he or she would be willing to pay for the security. I believe you have learnt something new about stock trading today, please keep in touch for more tips regarding trading stocks.